plan to be a part of it next year . . .
All photos (c) North Carolina Museum of History. For permissions, contact the museum photography unit, 919-807-7900. Longleaf 2018 starts winding up as film fans begin taking seats in Daniels Auditorium. Film Block A, the first of Longleaf 2018, opened with RELEASED, a film by Forrest Tuff. Film Block A on Friday concluded with Ricky Kelly’s BLACK BEACH, WHITE BEACH, which drew a crowd of bikers on beautiful rides. A respectable film festival is worth its supply of free popcorn! Daniels Auditorium is our big screen; get your seat in 3:01, 3:00, 2:59 . . .
Longleaf staffers make the best concessions shoppers and stockers; don’t you agree? Some of us are also extraordinary organizers (especially when duties call for reception setup). The North Carolina Film Orchestra entertained during our Friday evening Reception for Filmmakers and Friends. Reception decorations: do you feel at home? A huge part of the Longleaf squad: Jessica, Sally, Cassie, and Emily; THEY get stuff done! The Friday evening reception sold out! The evening reception was sandwiched between opening Film Block A and Movies-N-Moonlight. 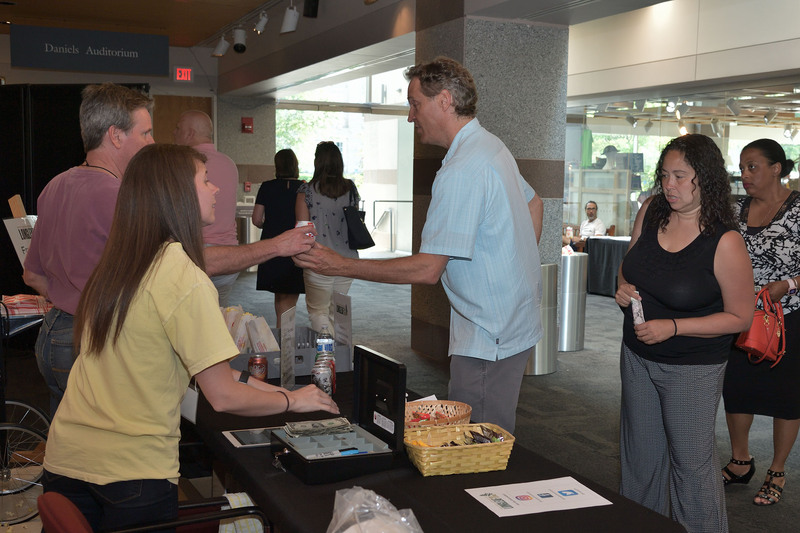 Longleaf community: filmmakers meeting film fans. Someone is ready for her close-up . . . The mood is festive for Friday evening’s reception. One of these is not like the other; which one is from North Carolina? Proud son, prouder mom! Selfie time! 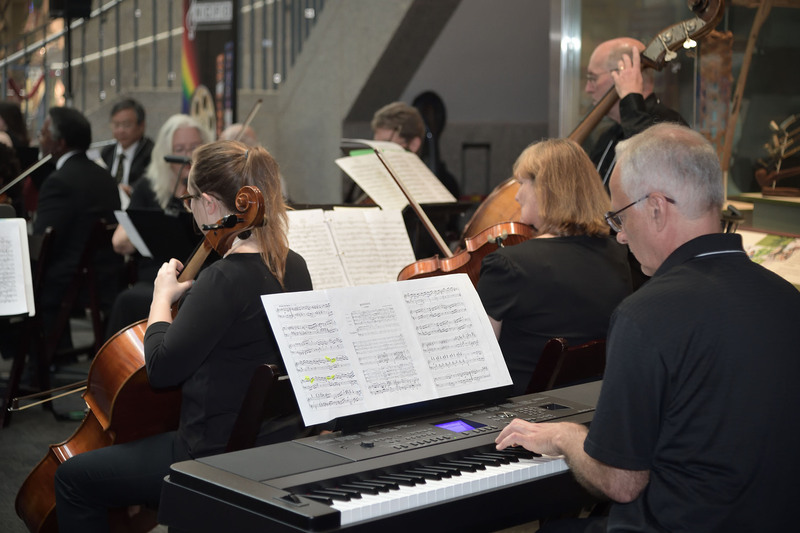 The North Carolina Film Orchestra was an in-kind sponsor of Longleaf 2018. 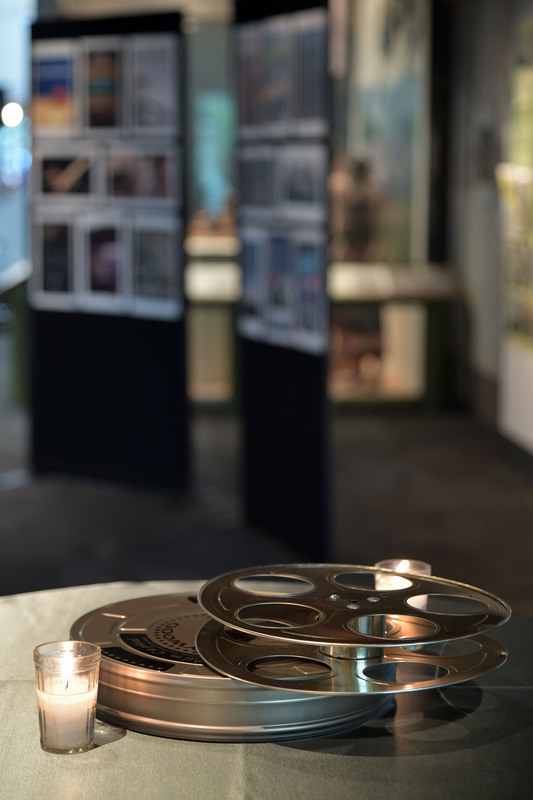 The performance added an elegant and entertaining touch to the Friday evening reception for filmmakers and film supporters. Marsha Gordon and Louis Cherry, the two directors of RENDERED SMALL. They do look the part, don’t they? 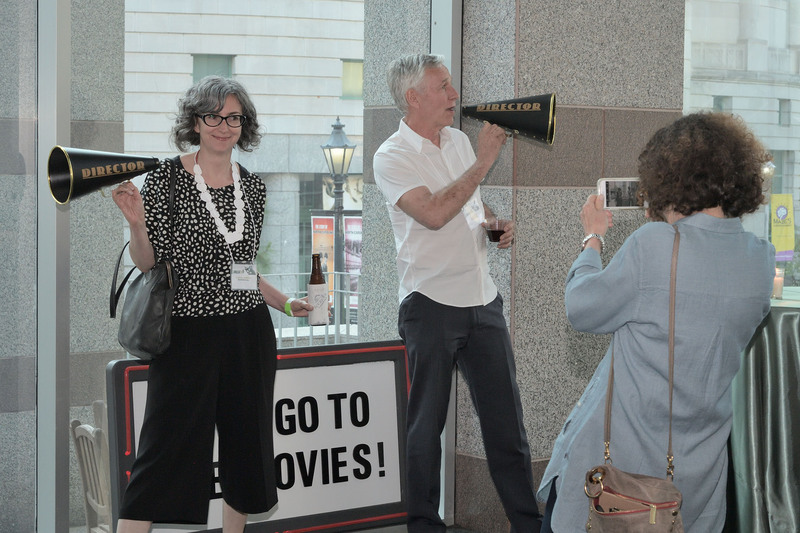 Friday evening’s Reception for Filmmakers and Friends is a ticketed event in the Museum of History Lobby. R2D2 and C3PO have been with us since the STARRING NORTH CAROLINA exhibit and Longleaf Year One (2015); Michelle and Lani, of the Full Frame Documentary Film Festival, are newer friends and supporters. Organizers for two local film festivals, Longleaf and Full Frame, hang out: Lani, Sally, and Michelle. We look good on that outdoor screen, don’t we? To think, we worried you wouldn’t come! Then, even in filtered late-afternoon sunlight, the crowd gathered. The sun is setting, the moon is shining, the bugs are staying away. And, WOW: Doesn’t that logo look good at night? Jonathan, one of our superest volunteers, rushed to put out more chairs in the last minutes before Movies-N-Moonlight as a larger-than-expected crowd continued to gather. Longleaf’s inaugural outdoor film block was a success and will no doubt be back for Longleaf 2019. Our one, annual photo of festival coorganizers Sally and Jerry; as usual, he rocked it! All these guys make movies. Good movies. Our annual T-shirts were very popular this year, and, by the way, you can still get yours at the Museum Shop. Movie posters promoting our Official Selection films are a favorite pastime with guests between films. It’s back! Our Foley interactive from the museum’s STARRING NORTH CAROLINA exhibit has returned from use at another venue; and it’s still fun for all ages! Each of our film blocks is separated with just enough time for a Q&A session with filmmakers present; Emily, here in front of the screen in Daniels Auditorium, is one of the hosts. 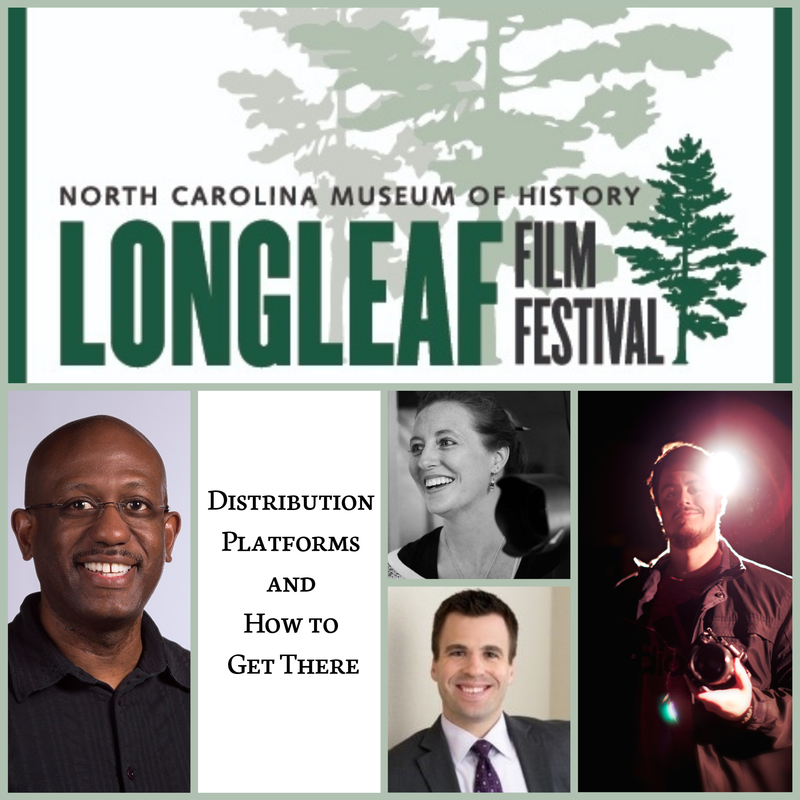 Longleaf organized and hosted two panels in 2018; the morning panel discussed North Carolina in film. Women in Film, North Carolina Style, our Saturday morning panel, featured (left to right) Beth Yerxa, Lana Garland, Camden Watts, Nicolle Jones, and Kelly Creedon. The time for doodling has passed; gotta take notes, have to take notes. Panelist Lana Garland, with Camden Watts looking on, shares thoughts at the Women in Film, North Carolina Style panel. The panelists for Women in Film, North Carolina Style made several points for their eager audience. Lana Garland, Camden Watts, and Nicolle Jones are all active participants in the North Carolina film industry. This future filmmaker is all ears at the Women in Film panel. Nicolle Jones and Kelly Creedon had interesting, and helpful, thoughts about women in film. Beth Yerxa approaches women in film from the viewpoint of women in many different arts. Lana Garland has worked in documentaries for television and film projects; Camden Watts is a native North Carolinian with a background in writing, producing, and directing independent films. Engaging discussions continued even after the panel ended. After the morning panel, Beth Yerxa helped Sally take just a few minutes off from work. Mr. Mongolian, made-to-order Asian stir fry, provided lunchtime service for festival attendees on Saturday. Between film blocks, even kids can do Foley. The perennial Dynamic Duo: coorganizer Sally and former-staffer-now-indispensable-volunteer Cassie. Popcorn and concessions: a Longleaf tradition (and fund-raiser). Film fans, captivated by movie magic during a Saturday film block in Daniels Auditorium. Volunteer Cassie Bennett entertains panel attendees as the room fills for Distribution Platforms and How to Get There, our afternoon session. Afternoon panelists for Distribution Platforms and How to Get There included Eric Johnson, Thomas Varnum, Elisabeth Haviland James, and Evan Kidd. Eric Johnson, who, with Trailblazer Studios, has helped projects reach screens at a number of national festivals, served as moderator for the Saturday afternoon panel. Longleaf’s afternoon panel explored distribution platforms and seeing projects through to distribution. Elisabeth Haviland James, a producer, director, and film editor based in Durham, helped provide insights from the afternoon panel. Time for questions and answers about distribution. Elisabeth Haviland James and Evan Kidd field questions during the Longleaf afternoon panel on distribution. Eric Johnson and Thomas Varnum take turns at the distribution panel. We hope this isn’t your MOST favorite part of the festival; but, if it is: we’ve got you covered. Mr. Puebla Tacos provided a tasty dinner option for festival attendees on Saturday. Filmmakers whose productions ran in the previous film block take questions from film fans in the audience. Sally takes a quick break with Mike, a three-time Longleaf Official Selection filmmaker. Another film block in Daniels Auditorium ends with another Q&A with those films’ filmmakers; increasing community. These one-of-a-kind, hand-crafted award tiles were lined up for presentation at the annual Longleaf Awards Ceremony for 2018. Awards time nears as Sally and Stephen sort and set up awards during the final Q&A session. The poised filmmakers of FORCE B1 (BEYOND THE OUTER RIM) answer questions about their production. Local filmmaker Steven P. Neilson (OH CRAPPY DAY, Dagtype Films) opens the annual free-to-attend Awards Ceremony. Alex Umfleet accepts an award tile for 2018 Animated Film, Best Overall: SUPERNOVA. Raymond Wallace’s Lost in Buffalo City won 2018 Narrative Short, Best Horror–Sci-Fi. Becky Barker accepts the award for We are the Dead: 2018 Best Narrative winner in the History+ Film category. Jim Darden accepts the award for Forgive—Don’t Forget: 2018 Best Documentary winner in the History+ Film category. Bradley Bethel accepted the 2018 Narrative Feature, Best Drama award for Born River Bye. 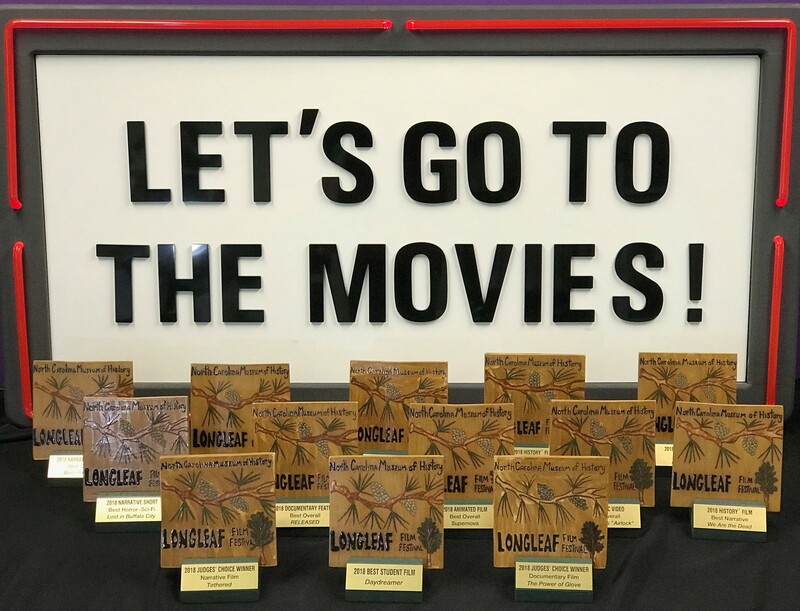 Documentary Feature, Best Overall winner for Longleaf 2018 was Forrest Tuff, Released. Documentary Short, Best Overall winner was Wil Weldon, for his 2018 Longleaf submission, The Imaginary Village of Allan Gurganus. 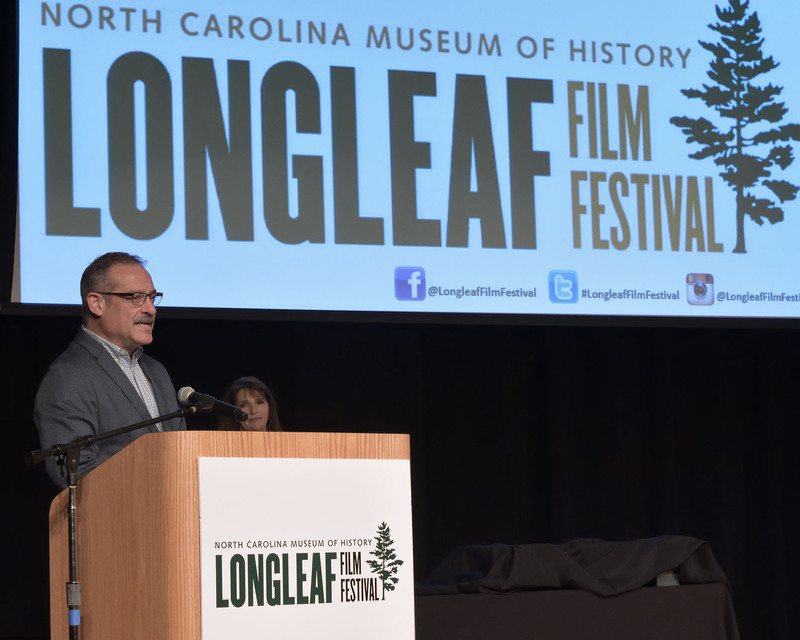 Longleaf was honored that North Carolina author Allan Gurganus, subject of Wil Weldon’s award-winning film, was able to attend its Awards Ceremony. Lauren Henderson accepted the Judges’ Choice Winner, Narrative Film award for Tethered. Adam Ward and The Power of Glove took home the award tile for Judges’ Choice Winner, Documentary Film at Longleaf 2018. If the question is “What is 73?” The answer must be “The number of Official Selections screened at Longleaf 2018.” Congratulations!